It's been a long time coming. This client project has dominated my life for quite a while. I am proud to announce the publication of The Baum Family of Kansas City. Members of the Jewish Baum family of Nordheim vor der Rhön, Lower Franconia, Bavaria, began immigrating to the United States in the 1850s. By the early 1900s family members were well established in several communities including Kansas City, Missouri; Norfolk, Virginia; New York City; Chicago; and Independence and Sioux City, Iowa. Offspring of the Kansas City branch married into prominent Jewish pioneer merchant families in Trinidad, Colorado (Gottlieb) and Las Vegas, New Mexico (Rosenwald). The publication is in three volumes. I researched and wrote Volume II. I researched the United States portions of Volume III and Dr. Ekkehard Hübschmann researched in Germany. I assembled our contributions and wrote Volume III. This volume is focused on investment banker George K. Baum (1892-1958), as recalled by his son G. Kenneth Baum (147 pages). Samuel Baum & His Children explores Baum family origins in Nordheim vor der Rhön, Lower Franconia, Bavaria, and provides individual chapter on Kansas City immigrant and merchant Samuel Baum (George K. Baum's father) and his children (328 pages). Volume III: Genealogy Report - by Emily H. Garber, with contributions by Ekkehard Hübschmann, PhD. The third volume contains 29 graphic family trees and a register (narrative) report on almost 400 descendants of Hirsch Baum who was born likely in the early 1700s. This nine generation chronicle is accompanied by a CD-ROM with images of many supporting documents (189 pages). A surname list for Volume III may be viewed here. A location list is here. This was going to be soooo cool. But now, it's back to the drawing board. A while back I was able to show that my great grandfather, Abraham Garber, had a full brother whose last name was Lederman. I did this through a combination of traditional records research and DNA results. I did a twelve-part series on that research. The last post may be viewed here. In short, the Lederman I tested is my second cousin one-removed. Pretty close. Feeling emboldened, I began to think that perhaps the family story that there had been four brothers in the Old Country who each adopted different surnames might, indeed, be true (see the story here). So, I set out the find the unusual name that had been identified as the original one: Utchenik. Now ordinarily I would not recommend trying to spend much time trying to prove family stories, but Utchenik is an unusual name and finding an Utchenik family was not particularly difficult. There seemed to be one main Utchenik family who primarily settled in Detroit, Michigan (also the place where one of my Ledermans settled). Some Utcheniks from the same related clan were also in Connecticut, Massachusetts and, for a short while, Florida. The family was also from Volhynia Gubernia - the same area as my Garber-Lederman family. I was not successful in finding a family tie via paper records. My main problem was finding some Utcheniks to DNA test. A few years ago I located one Utchenik descendant named Greenberg who agreed to test. His grandmother was an Utchenik by birth. His autosomal DNA test results did not include my Garbers or Lederman as strong matches. I know that sometimes third cousins may not appear as matches in autosomal DNA and, in at least one instance, that is the case in my own family. So I was not dissuaded from my quest with these particular results. If I could only find a male Utchenik to test for Y-DNA! That was a challenge until recently when a male Utchenik contacted me after seeing one of blog posts (Hurrah for blog posts!). The orange, above, is Greenberg. The largest of the Garber segments on this chromosome is 16.8; the smallest, 14.5 cms. The gap in the green and purple lines could be where some Utchenik DNA dropped out during the last few generations. Family Tree DNA predicted that all the matching Garbers but one were between third to fifth cousins with Utchenik. I showed up as fifth to remote. What I was really hoping for was a good haplogroup match on Y-DNA. It was not to be. So, I am thinking that, if we are related, it is not along the Garber-Lederman line. The good news? I have another Utchenik family I am looking at. Two Utchenik brothers from Polonnoye (about 10 miles from my family's tow of Lubin) changed their surname to Robinson after immigration. The bad news? One brother had no children and the other had only girls. The pretty good news? One daughter is still available to test. I am hoping she agrees. Meanwhile, I am trying to get around a seeming paucity of records on these Robinson/Utcheniks. Wish me luck! 1. Annette and Mel, who are 1C1R to me and 2 C to Lederman, show up sharing 99 cms and 14 largest segment (projected 3rd to 5th cousins) and 63 cms/9 cms (5th cousins to remote) with Greenberg, respectively. Greenberg shared only 56 cms and a largest segment of 8 (5th to remote) with Lederman. Generally, we like to see over 100 cms total and over 20 (better 30 cms) for the longest segment. My documented third cousins who show up as matches to me may have large segments under 20, but share more than 100 cms total. So, the Greenberg matches were nothing for a member of this endogamous Ashkenazi Jewish family to get excited about. 2. In case anyone is wondering, for my own edification I did compare STRs and there are over 40 differences between Utchenik (E-M35) and my Garber-Lederman (T-M70) group at the 37 marker level - in no way a close match. I have not found much about the life of Boris Bondar. I typically try to provide a bit of biographical information about those who were interred in the graves of the First Lubiner Progressive Benevolent Association plots in Montefiore and Beth Moses Cemeteries in New York. Boris, however, has been difficult to track. Boris' gravestone does not include the usual Hebrew name and patronymic. Rules for accessing New York City death records do not allow non-relatives access to one so recent. Online searches at Ancestry, FamilySearch and MyHeritage have not located any census records (the most recent available would be 1940), directories, or any other records that I can tie to this man. I have searched online indices on the Yad Vashem website (seeking any relatives he may have identified as victims), on the US Holocaust Memorial Museum website (for currently online records for survivors). I have searched the online Joint Distribution Committee Archive and HIAS. I have searched online newspapers for obituaries or any other articles in which he might have been mentioned. Nada! The only record I have found for him thus far is his application for Social Security card (Form SS-5), which I ordered from the Social Security administration. Boris' mother was Lyuba and his father was Shlema Bondar. Boris reported that he was born in Odessa. I have check JewishGen's unified database and have not found any records available yet for him Boris or his parents. He registered for Social Security when he was 80 years old (probably on November 6, 1978). At that time, he lived in Manhattan at 225 Park Avenue South. His Social Security Death Index record (in this case located on Ancestry) indicates his last residence was in Brooklyn. His gravestone indicates he was mourned by his wife. There are no other Bondar's in this plot. I checked recent indexes for marriage licenses in New York City (thank you Reclaim the Records!) - there are no records for Boris Bondar. We do not know his wife's name. 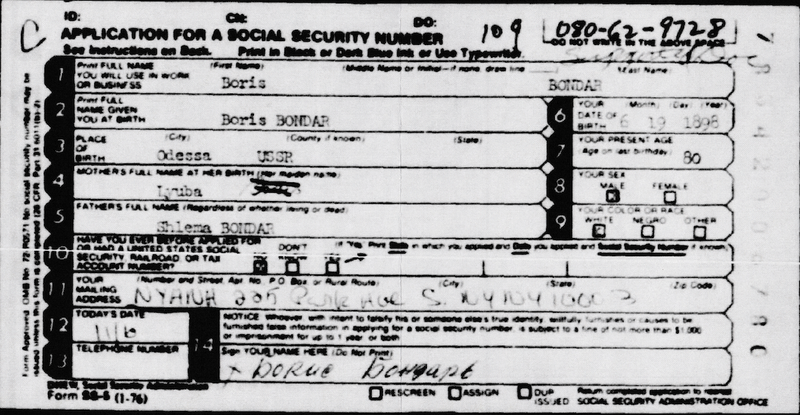 Since Boris signed his name in Cyrillic, it is possible that in 1978 he was a fairly recent immigrant. That would account for the paucity of records. Boris Bondar's grave is in the the Beth Moses Cemetery, Pinelawn, New York, First Lubiner Progressive Benevolent Association Plot, Block 24, Maccabee Road. 1. It is certainly possible that other records, such as those in probate files, might be located onsite in NYC. Those kind of searches will have to wait until I next plan a visit. One possible next step would be to call the cemetery and see if they have any information they might share regarding Bondar family contacts. I never understand why people leave conferences before they close. Excellent presentations are often given on the last day. When planning my flight home from Warsaw, I made sure that I selected a flight that would allow me to stay at the conference until the end (i.e., before lunch). I heard two excellent presentations on Friday morning. In fact, I think these two were among the better ones I heard this year. Ed Mitukiewicz presented, "Location, Location, Location: Using Historical Maps to Find Your Ancestral Towns in Eastern Europe." This presentation paired nicely with Carol Hoffman's on Wednesday afternoon. These should be required for anyone who is have difficulty locating their family shtetl. Ed completely won me over when he noted a methodology dear to my heart: one should compare and correlate information from multiple sources to locate one's ancestral community. It is similar to triangulation - look for the area of intersection among evidence in one's sources. Renee Carl's, " 'Did You Know Your Grandfather was a Twin?' And Other Questions I've Asked My Mother," addressed in another way a topic similar to the one I had presented on Tuesday in my talk "When It Takes a Village: Applying Cluster Research Techniques." She advocated for widening the net: collecting many records for many family members. Essentially, she argued for an iterative process between oral history and document research. This was all very good stuff. And imagine! It was all in the last two hours of the conference! See you in Cleveland in 2019! Seems like something comes up nearly each year that I miss the Professional Genealogists BOF meeting. I managed to attend last year. Last year I missed attending the IAJGS Annual Meeting because I was making a presentation (I sent another member of the Phoenix Jewish Genealogy Group to represent us). This year I figured I should attend the IAJGS Annual Meeting, myself. That meant missing the Professional Genealogists BOF, which was scheduled at the same time - Thursday morning. Such is the IAJGS conference experience when one is involved in one's community! IAJGS announced that new board members are Janette Silverman, Sarina Roffe and Christa Cowen (all U.S. residents). There was some animated discussion regarding the lack of new board members representing other countries this year. Apparently 1/3 of IAJGS member societies are international and the current board will not reflect that diversity. In the recruitment committee's defense, they apparently contacted representatives of non-USA societies and no one from those societies stepped up this year. I imaging that two year's from now some new tactics will be employed. This past year the membership committee has been employing new tactics that resulted in ten new societies joining the IAJGS. These include societies in Albany, NY; Kansas City, MO; Hungary; northeast Florida and Fort Wayne, Indiana. Nice! Two awards winners were announced. The Stern Award went to Litvak SIG for their "Vilna Household Register Books project." Reclaim the Records took the Stegman Award for their acquisition of the New York City birth and death indices. Next year in Cleveland! - 28 July - 2 August 2019. Thursday was just that sort of day, and I had to make a hard choice for my next event, as well. There were a number of good options and I chose to attend Doug Hykle's "Documenting the Life and Death of an Eastern European Shtetl - Research Sources for Genealogists." I first made Doug's acquaintance several year's ago when he asked me for contact information for my 2nd cousin once removed, Sally Eisner, who was born in Zaleszczyki, moved to nearby Torskie when she was about 10, and was interned in Tluste (Tovste) during part of WWII. Quite a few years ago Sally had recorded her recollections for the USC Shoah Foundation and Doug had some questions for her about her experiences and testimony. With information I was able to provide, Doug made contact and traveled to Sally's home to interview her in-person. He's that kind of researcher. He describes his work as "community-scale forensic genealogy" and he has created and manages a wonderful website on Tovste that chronicles both Jewish and non-Jewish life in the community. Original sources come from the State Archives in Lviv, where the earliest Tluste Jewish records date to 1787. Through Yad Vashem databases, the International Tracing Service, Gesher Galicia; testimonies from the USC Shoah Foundation and the Fortunoff Collection (at Yale University); and Sefer Tluste Doug has developed a spreadsheet of about 2,600 victims in 700 families. Doug Hykle's research is a tour de force. So glad I attended his session. For this conference, as I have for the last several, I organized an informal Jewish genealogy blogger's get-together. This year we did a bring-your-own lunch. Ten bloggers (or blogger wanna-bes) attended - which was more than I expected. We chatted about the blogging platforms we use and their pros and cons. Several of us who use Blogger (a Google product) are worried that Google, based on past history with other apparently non-monetized products, might not continue to support it. We have no inside information, really. We also talked about different emphases and pages on our blogs that some use as lures for readers. These include Philip Trauring's forms and Compendium of Jewish Genealogy on Blood and Frogs; Lara Diamond's genetic genealogy articles on Lara's Genealogy; Banai Feldstein's WDYTYA nitpicker articles at The Ginger Jewish Genealogist. A year of so ago I added list of Jewish genealogy blogger's as a page on my blog. Other current bloggers in attendance included: Marysia Galbraith - Uncovering Jewish Heritage; Mary-Jane Roth - MemoryKeeper's Notebook; and Daniel Horowitz, who contributes to the MyHeritage blog. I'd a busy morning, but, fortunate for me, I was well-prepared for my presentation: "Learning Our Craft: Online Opportunities for Improving Our Research Skills." The concept for this presentation is that one ought to return to the IAJGS conference next year with a solid year's worth of genealogy learning and experience under one's belt. The talk provides information on how to find blogs, podcasts, webinars and online courses and programs. I had quite a good audience for this presentation - which was not recorded. I attended Carol Hoffman's short presentation, "Where's My Shtetl OR What's in a Name?" because overcoming challenges in identifying towns of origin is one of my pet topics (and peeves). I had no problems with Carol's presentation. Carol, past-President of Litvak SIG and 2018 IAJGS Volunteer of the Year, ably covered the topic within the limited time-frame. The limited time meant the presentation had to be basic and there was not a great deal of time for the audience to ask questions. I have to admit that I am not a fan of the short presentation format that IAJGS has introduced in the last couple of years. I especially feel this format is unnecessary at a conference outside the USA where all presentations have been shortened to one hour (45 minute talk plus questions) from the usual 75 minutes (one hour talk plus questions). Short presentations (25 minutes) short-change discussion and push speakers to over-simplify their topics. The general reception for all conference attendees was held immediate before the Thursday evening banquet. And immediately before that was the IAJGS President's reception. Since I am a JGS president, I was invited. I definitely did not need any more food! I like to eat breakfast and I am not used to eating as late as I have been at this conference. Polish people seem to do dinner a bit late in the evening. Eating late means I am still digesting when I wake up in the morning. At this reception I was, however, quite happy with the provided glass of wine. Early in the conference Max Heffler offered to reserved a seat for me at the JewishGen table during the banquet. That was pretty nice because the table is in the front row (it was also nice because there were some nice people at the table). The banquet speaker was Kanstanty Gebert, listed as a journalist and Jewish activist. He also has taught a universities in Poland, Israel and the USA. His talk at the banquet centered on the complex development of Polish feelings toward remembering the Holocaust and the place the Jewish community once had in Polish society. I know that few things in life are one-sided or black and white. And Gebert's talk, placing the evolution of Polish and Jewish attitudes in recent historical context, surely bore that out. The IAJGS Lifetime Achievement Award went to Mark Halpern. All I can say is that Mark is one of the kindest, most generous and accessible genealogists I know. I, like so many others, are indebted to him for his good work and his willingness to help and share. Outstanding Publication by a Jewish genealogical society went to Venturing Into Our Past, JGS of Conejo Valley (California). I mentioned earlier that Carol Hoffman was named Volunteer of the Year. They actually gave two awards this year. Another went to Max Heffler. A Special Award for volunteer service went to Susan Edel. 1. As a matter of fact, this is a topic I have spoken on at several past conferences and published on in Avotaynu. I did not offer to present on this topic this year. © 2012-2013 Emily Garber. Simple theme. Powered by Blogger.